The Tallgrass prairie is an ecosystem native to central North America. Natural and anthropogenic fire, as well as grazing by large mammals (primarily bison), were historically agents of periodic disturbance, which regulates tree encroachment, recycles nutrients to the soil, and catalyzes some seed dispersal and germination processes. Prior to widespread use of the steel plow, which enabled conversion to agricultural land use, tallgrass prairies expanded throughout the American Midwest and smaller portions of southern central Canada, from the transitional ecotones out of eastern North American forests, west to a climatic threshold based on precipitation and soils, to the southern reaches of the Flint Hills in Oklahoma, to a transition into forest in Manitoba. They were characteristically found in the central forest-grasslands transition, the central tall grasslands, the upper Midwest forest-savanna transition, and the northern tall grasslands ecoregions. They flourished in areas with rich loess soils and moderate rainfall around 30-35 inches (700–900 mm) per year. To the east were the fire-maintained eastern savannas. In the northeast, where fire was infrequent and periodic windthrow represented the main source of disturbance, beech-maple forests dominated. In contrast, shortgrass prairie was typical in the western Great Plains, where rainfall is less frequent and soils are less fertile. Due to expansive agricultural land use, very little tallgrass prairie remains. Retreating glaciers deposited the parent material for soil in the form of till, i.e. unsorted sediment, about 10,000 years ago. Wind-dropped loess and organic matter accumulated, resulting in deep levels[ citation needed] of topsoil. Animals such as bison, elk, deer, and rabbits added nitrogen to the soil through urine and feces. Prairie dogs, a ground squirrel-like rodent considered to be a keystone species, dug tunnels that "aerated the soil and channeled water several feet below the surface." For 5,000 to 8,000 years, more than 240 million acres (970,000 km2) of prairie grasslands were a major feature of the landscape. Between 1800 and 1930, the vast majority was destroyed. Settlers transformed what they named "the Great American Desert" or "The Inland Sea" into farmland. Major reasons for the prairie's demise were the confined grazing pattern of European cattle versus bison, the near-extermination of prairie dogs, and the plowing and cultivation of the land, which breached tallgrass root systems and interrupted reproduction. Further, extensive tile drainage has changed the soil's water content and hydrodynamics, and ongoing soil erosion results in its increasing loss. Estimates differ of how much original tallgrass prairie survives, ranging from less than 1% mostly in "scattered remnants found in pioneer cemeteries, restoration projects, along highways and railroad rights-of-way, and on steep bluffs high above rivers"  to 4%. The tallgrass prairie biome depends on prairie fires, a form of wildfire, for its survival and renewal. Tree seedlings and intrusive alien species without fire tolerance are eliminated by periodic fires. Such fires may either be set by humans (for example, Native Americans used fires to drive bison and improve hunting, travel, and visibility) or started naturally by lightning. As its name suggests, the most obvious features of the tallgrass prairie are tall grasses, such as indiangrass ( Sorghastrum nutans), big bluestem ( Andropogon gerardi), little bluestem ( Schizachyrium scoparium), and switchgrass ( Panicum virgatum), which average between 4.9 and 6.6 ft (1.5 and 2 m) tall, with occasional stalks as high as 8.2 to 9.8 ft (2.5 to 3 m). Prairies also include a large percentage of forbs, such as lead plant ( Amorpha spp. ), prairie rosinweed ( Silphium spp. ), gayfeathers ( Liatris spp. ), sunflowers ( Helianthus spp. ), asters ( Aster and Symphyotrichum spp. ), coneflowers ( Echinacea spp., and Rudbeckia spp. ), and many other species. Technically, prairies have less than 5–11%[ clarification needed] tree cover. [ citation needed] A grass-dominated plant community with 10–49% tree cover is a savanna. After the steel plow was invented by John Deere, this fertile soil became one of America's most important resources. Over 95% of the original tallgrass prairie is now farmland. A pink wild onion ( Allium stellatum) — blooms in the tallgrass prairie of Waubay Wetland Management District in South Dakota. The tallgrass prairie survives in areas unsuited to plowing: the rocky hill country of the Flint Hills, which runs north to south through east-central Kansas; the eastern fringe of the Red River Valley ( Tallgrass Aspen Parkland) in Manitoba and Minnesota; the Coteau des Prairies, which extends from South Dakota through Minnesota and into Iowa; and the far north portion of Oklahoma. 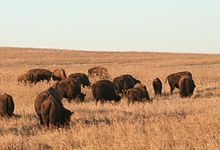 In Oklahoma, the tallgrass prairie has been maintained by ranchers, who saw the hat-high grass as prime grazing area for cattle. The original extent of tallgrass prairie in Canada was the 2,300-square-mile (6,000 km2) plain in the Red River Valley, southwest of Winnipeg in Manitoba (see map). While most of Manitoba's tallgrass prairie has been destroyed through cultivation and urban expansion, relatively small areas persist. One of the largest blocks of remaining tallgrass prairie in Manitoba is protected by several conservation partners in a conservation area called the Tallgrass Aspen Parkland. The Manitoba Tall Grass Prairie Preserve, which occupies small portions of the rural municipalities of Stuartburn and Franklin, forms a part of the Tallgrass Aspen Parkland. This preserve contains about 4,000 ha (9,900 acres) of tallgrass prairie, aspen parkland, and wetlands. A small pocket of less than 1,200 acres (5 km2) of tallgrass prairie remains in the southwest corner of Windsor, Ontario, protected by Ojibway Park, and Spring Garden Area of Natural Scientific Interest, along with the interconnected parks: Black Oak Heritage Park, Ojibway Prairie Provincial Nature Reserve, and the Tallgrass Prairie Heritage Park. Aside from the Provincial Nature Reserve, all are operated by the City of Windsor's Parks and Recreation. Packard, Stephen; Mutel, Cornelia F., eds. (1997). The Tallgrass Restoration Handbook: For Prairies, Savannas, and Woodlands. Island Press. Kurtz, Carl (2001). A Practical Guide to Prairie Reconstruction. University of Iowa Press. Helzer, Chris (2009). The Ecology and Management of Prairies in the Central United States. University of Iowa Press. Smith, Daryl; Williams, Dave; Houseal, Greg; Henderson, Kirk (2010). The Tallgrass Prairie Center Guide to Prairie Restoration in the Upper Midwest. University of Iowa Press. ^ a b Pam Graham: “Tallgrass Prairie”ProQuest Discovery Guides http://www.csa.com/discoveryguides/discoveryguides-main.php Released November 2011. ^ "Microbes Beneath the Surface". Science Today: California Academy of Sciences. Retrieved 26 September 2014. ^ a b "Central forest-grasslands transition". Terrestrial Ecoregions. World Wildlife Fund. ^ a b Klinkenborg, Verlyn (April 2007). "Splendor of the Grass: The Prairie's Grip is Unbroken in the Flint Hills of Kansas". National Geographic. ^ "Into the Wild: Indian Boundary Prairies". Chicago Wilderness Magazine. Fall 2008. Archived from the original on 14 April 2014. ^ "Prairie Grasslands and Parkland". Environment Canada. 22 August 2008. Archived from the original on 27 May 2010. ^ Jordan, III, W. R. (2011). Making nature whole : a history of ecological restoration. Washington, DC: Island Press. ISBN 9781610910422. OCLC 750183084. ^ Court, F. E. (2012). Pioneers of ecological restoration : the people and legacy of the University of Wisconsin Arboretum. Madison: University of Wisconsin Press. ISBN 0299286630. OCLC 814694131. ^ Madson, John (1982). Where the Sky Began: Land of the Tallgrass Prairie. Boston, Mass. : Houghton Mifflin Company. ^ "Native Prairies Association of Texas". www.texasprairie.org. Retrieved 10 April 2018. ^ "The Nature Conservancy - Glacial Ridge Project". Nature.org. Retrieved November 14, 2007. Wikimedia Commons has media related to Tallgrass prairies (North America). Tallgrass Prairie - Video footage of the area and a list of relevant resources.